Major conflict of interest arises following revelations that the European Parliament's rapporteur on the Western Sahara trade file is Board Member of a pro-Morocco lobby group. UPDATE, 26.11.2018: MEP Lalonde has responded to EU Observer that she is also Member of the European Parliament's Intergroup for Western Sahara. The list of members of that Intergroup is available on Parliament's website [or download]. MEP Lalonde is not on that list. EUobserver today published an investigative piece on the EuroMedA Foundation - a foundation fronting for Morocco, based in the office space of the Brussels offices of lobby firm Hill+Knowlton Strategies - which has the Moroccan state as one its biggest clients. Patricia Lalonde, the European Parliament's rapporteur on the controversial proposal to extend the EU-Morocco Trade Agreement into occupied Western Sahara, is one of the Board Members of EuroMedA. Ms Lalonde's fellow Board Members include former Moroccan Ministers of State, and current top-ranking officials of Morocco's Ministry of Agriculture. The foundation is not listed in the EU's lobby register. Its statutes are however in the public domain: find them in the Belgian registry (or download as pdf). The Foundation lists among its activities: "the creation of a sustainable structure dedicated to strengthening links between Europe and Morocco, with the aim of being enlarged" and "putting into perspective the specificity of the Sahara region, its strategic geopolitical aspect and the importance of its economic, social and environmental sustainable development". This is confirmed by Moroccan media today, as Le Desk describes the Foundation as "dedicated to promoting Morocco for which it multiplies soft power actions within the European Parliament". "MEP Lalonde's role as Board Member of this Foundation raises serious questions regarding the legitimacy of having her continue in her function as Parliamentary Rapporteur on the proposed trade arrangement for occupied Western Sahara, without being seen as biased. This will overshadow the discussions in the International Trade committee and in the Parliament's plenary session", says Sara Eyckmans from Western Sahara Resource Watch (WSRW). WSRW on 18 October wrote that it found Lalonde's report to the Parliament to be biased, to the benefit of Morocco. 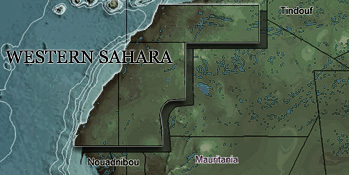 WSRW also wrote that the delegation that Lalonde had led to the occupied territory was highly controversial in that it spent nearly all its time on meeting Moroccan interests, and that Lalonde had expressed her support to a new trade deal to Moroccan media already on the first day of the delegation's trip, without even having met Saharawis. EUobserver's article describes how underscoring issues as migration and terrorism in the EU relationship with Morocco "appear to render the plight of the Saharawi in the Western Sahara all the more insignificant. The balancing act was on display earlier this year by Lalonde, who sits on the parliament's powerful committee on international trade." Lalonde is quoted in the article, saying "We have strong common interests and especially concerning immigration and security issues like radicalisation and terrorism," when asked to describe the importance of Morocco-EU relations. "We have to prove on the ground that the people of the Western Sahara benefit from the commercial agreement," she added. The article makes the point that "because she is the lead MEP on the trade pact, her views will shape the European parliament's overall position. The deal seeks to reduce tariffs on things like tomatoes and fish oils coming out of the disputed territory. That Lalonde is a EuroMedA board member has however raised eyebrows over her neutrality as a rapporteur on such a big file." EuroMedA's vice-president is Salaheddine Mezouar, Morocco's former Foreign Affairs Minister. Other Board Members include Mohamed Cheikh Biadillah and Abdallah Saaf, ex-Ministers of Morocco, and M'barka Bouaida, Morocco's former Minister-Delegate of Foreign Affairs, who represents Morocco in the Euro-Mediterranean Parliamentary Assembly. Hill+Knowlton Strategies chief director Alain Berger is a founding member of the Foundation, and its secretary-general. WSRW has learned that MEP Florent Marsellesi has today lodged a complaint against Hill+Knowlton with the request of clarifying whether the lobby firm's behaviour is in line with the code of conduct. Another founding member is French MEP Gilles Pargneaux (S&D), former President of the MEP Friendship Group with Morocco, and known for taking a pro-Moroccan government position on Western Sahara. When confronted by EUobserver, "Pargneaux concedes that the Western Sahara does not belong to Morocco, describing it as a 'no man's land, which belongs to nobody'. At the same time, he praises Morocco for pouring in money and investment to develop the area." Moroccan news agency Le Desk today describes Pargneaux as "a flip flop" and "double-tongued lobbyist for Morocco" for saying "he does not recognize the kingdom's sovereignty over Western Sahara". Le Desk also casts doubts on the claims of Parneaux, "a convinced lobbyist for the cause of the kingdom", that EuroMedA was his idea, stating that the presence of so many Moroccan officials in the Board leaves little doubt as to whom really runs the Foundation. Pargneaux and Lalonde aren't the only MEPs that play an active role in the EuroMedA Foundation. Two other MEPs are Board Member, Frédérique Ries from Belgium (ALDE) and Romanian Romana-Nicole Manescu (EPP), who according to Le Desk "regularly pleads for the continuation of the Morocco-EU agreements". None of these four MEPs have disclosed their membership on the Board in their declaration of financial interests, as they are expected to do under Article 4 of the Code of Conduct for the Members of the European Parliament with respect to Financial Interests and Conflicts of Interest. The Code requires MEPs to declare their membership "before speaking or voting in plenary or in one of Parliament’s bodies, or if proposed as a rapporteur, any actual or potential conflict of interest in relation to the matter under consideration", regardless of "whether the membership or activity in question is remunerated or unremunerated".